Join us with your friends and family for a fun experience out on the water! Located in Beautiful Montego Bay, our Catamaran Cruise provides an unforgettable experience that will stay with you for the rest of your life. Sail off this exciting cruise that features exquisite views on the sea, sip rum punch at our open bar, sway to the rhythms of the pulsating reggae beats, go for a snorkel in the Montego Bay harbor and check out our beautiful corals and fishes, stop at eh famous Margaritaville where you can continue with the party, check out their signature drinks, scrumptious foods, dance to their DJ pumping the latest hits or check out their 120 ft. slide and water trampolines. 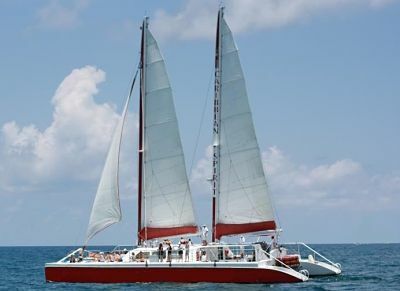 Montego Bay Catamaran Cruise, party boat and booze cruise experience is a must when you are in Jamaica, we will pick you up at your resort and take you back after you cruise. Be sure to pack you Towel, swimsuit, camera and sunscreen, our Montgo Bay Catamaran cruise is great for Wedding parties, anniversaries, bachelor parties and many more celebrations.